Stems compact to short-creeping; stem scales uniformly tan or somewhat darker near base, to 15 mm, margins ciliate-dentate to entire. Leaves 10--50 cm. Blade pinnate-pinnatifid, pinna pairs 20--45. Pinnae ovate to deltate, largest 7--15 mm, usually symmetrically lobed, lobes 6--11, broadly rounded, separated by shallow sinuses; abaxial scales concealing surface, lanceolate, usually 1--1.5 mm, ciliate with coarse marginal projections; adaxial scales sparse, mostly persistent, elongate, usually stellate, attached at base, body 2--4 cells wide. Sporangia containing 32 spores. n = 2 n = 87, apogamous. Sporulating summer--fall. Rocky hillsides and cliffs; occurring on calcareous and noncalcareous substrates; 1200--2100 m; Ariz., N.Mex., Tex. ; n Mexico. 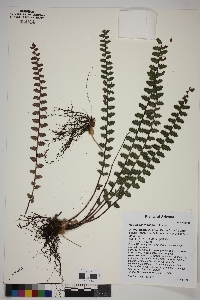 Recent isozyme analyses (D. M. Benham 1989) indicate that Astrolepis windhamii is an apogamous allotriploid that contains three different genomes, one each from A . sinuata , A . cochisensis , and an unnamed Mexican taxon related to A . crassifolia . Because of this genomic constitution, Astrolepis windhamii tends to bridge the morphologic gap between A . sinuata and A . integerrima , which is itself a hybrid between A . cochisensis and the unnamed Mexican species. Although the features that separate these taxa are subtle, the pinna lobing and scale characteristics of A . windhamii mentioned in the key adequately distinguish them in most cases.